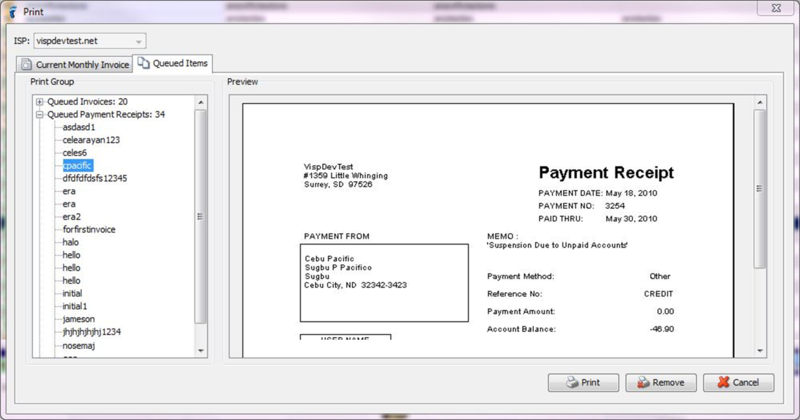 In the software, queued items are those records that you have saved to be printed for later. Some items that can be queued are invoice and payment receipts. While you are editing these items (usually within their respective windows), you can see a checkbox for adding them into the queue; click this checkbox and the item is saved for later printing and even mailing. You can find the list of saved items by going to File on the menu bar, then clicking Print. A new window will appear, containing two tabs. The first one is for your current monthly invoices – it lists your subscribers usernames, and you can just select whose invoice you’re going to print. The queued items, however, are in the second tab. Here, you’ll find not only invoices, but all the items you’ve saved. Expand or double-click on the type of item – for example, queued receipts – then choose from the list of usernames whose item you want to print. For both tabs, there is a preview so you can see what your selected item will look like when it’s printed. If you’re satisfied with this, just click Print and the printing process should start. If you want to modify the item before printing, you can edit it (see appropriate sections on editing documents). Or, if the item no longer needs to be printed, click Remove (removing an item from the list is just one click away, so make sure you really want to do it before you click). In printing an invoice, you have the option to send it to the third-party print house for printing, stuffing, stamping, sorting, and delivery to the subscriber. This option minimizes hassles for a little additional cost. 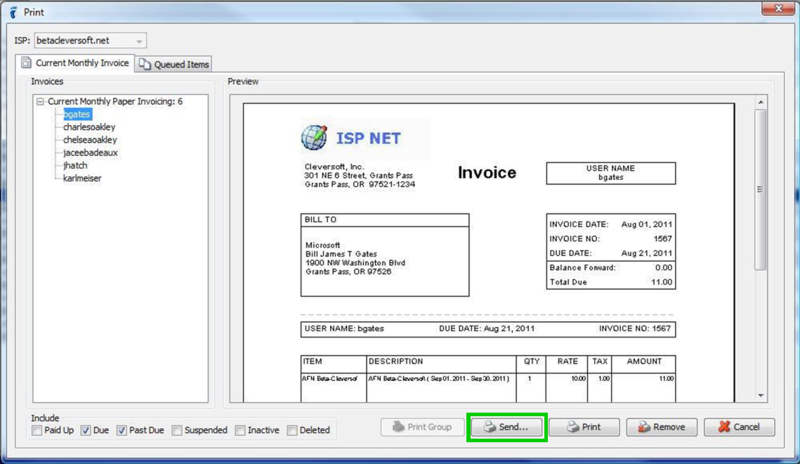 Open the Print window and select the invoice you want to print and mail. Review this invoice, and when it's ready for printing and mailing, just click Send. The software will alert you on your POG balance with regard to the printing and delivery cost. If you are okay with this, click Send Invoices Now and it's done.